Reviews of this weekend's Bridge School Benefit concerts continue to roll in. "Though his voice was a bit rusty, McCartney was his old self, throwing arms in the air after nearly every song and hamming it up whenever possible. He brought out Young for "Only Love Can Break Your Heart," which was a bit bumpy as McCartney tried keeping up with a tune with which he wasn't completely familiar. He went back to his strengths, through "Yesterday," "Get Back," "Let it Be," "Lady Madonna" and show-closer "Hey Jude." Unlike recent years, nearly all the musicians hung around for the obligatory ending. You could see the excitement, even on the faces of veterans, in sharing the stage with McCartney, making it one of the rare all-star jams worth the wait." "Had the outdoor Amphitheatre boasted a ceiling, applause for veteran crooner Tony Bennett would have brought it down. Looking dapper in black tie and backed by a slick combo, he inspired slow dancing and multiple ovations as he glided through a repertoire that included "The Best is Yet to Come," "I Left My Heart in San Francisco" and an extended version of "Maybe This Time." Highlights: An unexpected anti-war sentiment ("My personal prayer is that someday someone will find a way for people to stop killing each other," Bennett said by way of introducing "If I Ruled the World") and a duet, brief waltz and chaste kiss with guest Paul McCartney during "The Very Thought of You." "
"The Bridge School Benefit show is consistently the best musical event in the Bay Area every year. This year was no exception. 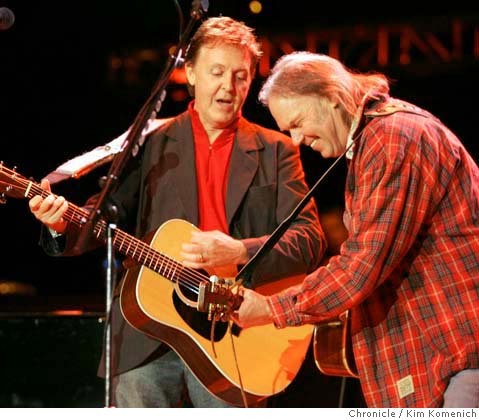 Neil Young is so highly respected by other musicians that he can draw the best talent in the world to play at these shows. Over the years, Neil has made an effort to stage both baby boomer and generation x aged rock acts on the same bill. This allows younger audience members to get to know bands their parents love and visa versa. During Neil’s set on Saturday, he mumbled, “Wow, Sonic Youth and Tony Bennett on the same stage. Isn’t that fantastic?” Fantastic indeed. Well done, Neil!" More on this year's Bridge Concerts here and here. TELL ME THIS MAN IS NOT GOD!!! I DARE YOU!! sorry, had to get that off my chest.